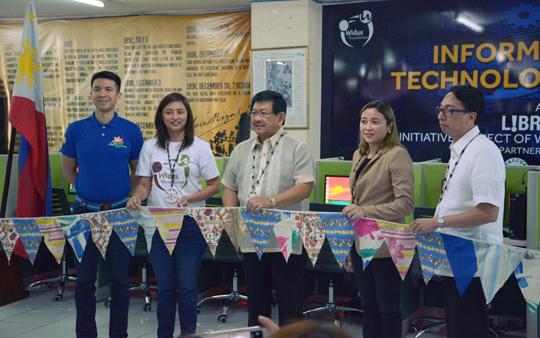 In time for the 60th Public Library Day celebration, Widus Foundation Inc. donates to the Angeles City Public Library an Information and Technology Center, a Leisure Reading Center, and a Center for Kampampangan Cultural Heritage on Monday, March 11. Leading the official turnover are WFI Executive Director Neki Liwanag, Widus Human Resources Director Ana Christi Galura, and Widus General Manager Tarek Aouini with Angeles City Mayor Ed Pamintuan, Vice Mayor Bryan Nepomuceno, PAGCOR Gaming and Licensing Development Department Head lawyer Angeline Papica-Entienza, and PAGCOR-Casino Filipino Angeles Sr. Customer Relations Officer Oscar Rodriguez Jr.